Drinking wine is supposed to be a genteel, sophisticated sort of thing. Traditionally, you drink a nice Malbec or Bordeaux with a wine glass, because drinking straight from the bottle is frowned upon by mostly everyone. But it might not be after you check out the Guzzle Buddy. 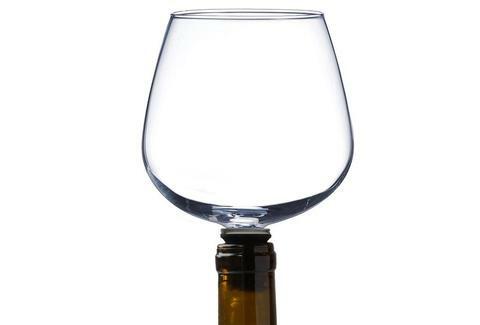 With this genius device -- which is basically a wine glass funnel, meant to be inserted in the neck of your wine bottle -- you can take the liberty of guzzling down vino like a raging frat boy, but still maintain an air of classiness. Guzzle Buddy gives one the illusion of a glass when slammed into the neck of a bottle, providing an ironic twist on booze etiquette. On Amazon, the product description touts the Guzzle Buddy’s practicality “for weddings, brides and grooms, bachelorette parties, housewarming, kitchen gift, birthday, anniversary and more.” While offering many applications, the description might sell the product short, because we all know that the Guzzle Buddy would be great for a solitary evening on your couch, perhaps with a side of Netflix. You can order one for $14.49 on Amazon.